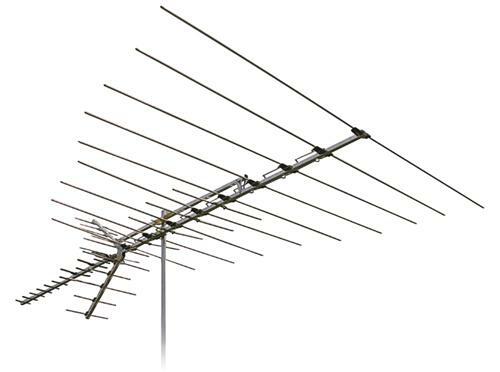 How high up should you mount an antenna? When 6’4″ President Abraham Lincoln was asked how long he thought a man’s legs should be, he is said to have replied, “long enough to reach the floor.” The man was tall by our standards, but an outright giant by the standards of the day. He was also known for having a plain-spoken sense of humor. The quote, whether or not it was actually true, embodies that. So, when asked how high up one should mount an antenna, my tendency is to echo President Lincoln and say “high up enough to see the towers.” While that may seem to be a copout, it’s actually a reasonable way to tell you that every situation is different and there is no right answer for everyone. The number one problem with getting good reception is distance. The further away you are from the towers, the worse the reception is going to get. There’s nothing you can do about that; most of us aren’t willing to move just to get better TV reception. (If you are one of the people who would do that, my hat goes off to you for your level of commitment.) So really there’s nothing you can do about distance. On the other hand, you can deal with the number two problem: obstructions. Whether it’s the construction of your home, the trees in your way, or a nearby hill, anything that comes between you and those broadcast towers is going to cut the effectiveness of the signal and mean that you won’t get the channels you want. So, the best way to start when you’re figuring out how high up to mount that antenna is to look around you. Are there trees, houses, or anything else stopping you from getting that clear view of the sky? If it’s something like a tree on your property that you can trim, that’s fine. Otherwise you will want to plan to get that antenna up high to get past as much as possible. So once you’ve figured out how high you want to get the antenna, you then have to look at your own level of commitment. If you have to go up 50 feet to get a clear view of the sky, are you willing to put up a tower and secure it with guy wires? (Again, hat’s off if you are.) Most people aren’t. So in a case like that you’re talking about finding the highest point in your house and mounting something 5-10 feet higher than that. That may be all you’re willing to do, and one way to compensate there is to put up a larger antenna that will do the best possible job pulling in the signal that can be pulled in. I would encourage you, however, to be especially careful to ground an antenna if it’s the tallest thing on the house. One lightning strike can ruin your whole day, as they say, and if you make the antenna an attractive place for lightning to find by putting it up high, you’re essentially ignoring any other grounding that’s been put in place. That can be extremely dangerous.